“How can we become people of nonviolence and help the world become more nonviolent? How can we help build a global grassroots movement of nonviolence to disarm the world, relieve unjust human suffering, make a more just society and protect creation and all creatures?” These are the questions John Dear, Nobel Peace Prize nominee and Pace e Bene staff member poses in his latest book, The Nonviolent Life. He focuses on three important aspects on the path toward becoming people of nonviolence – being nonviolent toward ourselves; being nonviolent to all others (including creation and creatures); and joining the global grassroots movement of nonviolence. 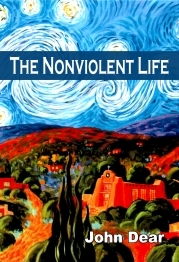 After thirty years of preaching the Gospel of nonviolence John says he has never found a book that completely captures these crucial elements of nonviolent living. According to John, “most people pick one or two of these dimensions, but few do all three. To become a fully rounded, three dimensional person of nonviolence we need to do all three simultaneously.” In this book, John Dear explores the powerful journey of nonviolence rooted in the Christian vision of love. Each participant will need a copy of the book “The Non Violent Life” by John Dear. They can be ordered at www.paceebene.org or amazon.com. Each week, in preparation for the meeting you will read portions of the book and engage in a practice. Bill Lewis will be facilitating the Book Discussion. Group size limited. To reserve a spot CLICK HERE.